Bottlenose Dolphin (Tursiops truncatus) - pod, and a Spinner Dolphin (Stenella longirostris) swimming freely in the wild with the pod. Cocos (Keeling) Islands, Australia. Found in tropical and sub-tropical oceans throughout the world. Spinner Dolphin (Stenella longirostris) - a pair swimming naturally in the wild with a single Bottlenose Dolphin (Tursiops truncatus). Cocos (Keeling) Islands, Australia. Found in tropical and sub-tropical oceans throughout the world. Spinner Dolphin (Stenella longirostris) - leaping out of the water in the wild. Cocos (Keeling) Islands, Australia. Found in tropical and sub-tropical oceans throughout the world. 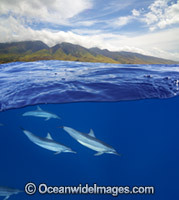 Pod of Spinner Dolphins (Stenella longirostris). Also known as Long-snouted Spinner Dolphin. Found in tropical waters throughout the world. Photo taken off Hawaii, Pacific Ocean. Spinner Dolphin (Stenella longirostris), at the surface. Also known as Long-snouted Spinner Dolphin. Found in tropical waters throughout the world. Photo taken off Hawaii, Pacific Ocean. Spinner Dolphin (Stenella longirostris) breaching. Note cookie cutter shark bite on side. Also known as Long-snouted Spinner Dolphin. Found in tropical waters around the world. Photo taken off Yap, Micronesia. 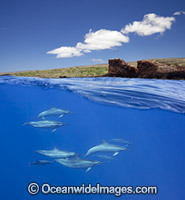 Spinner Dolphins (Stenella longirostris), breaching. Also known as Long-snouted Spinner Dolphin. Found in tropical waters around the world. Photo taken off Hawaii, Pacific Ocean, USA. 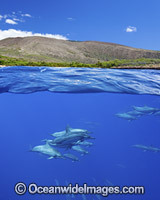 Spinner Dolphins (Stenella longirostris). Also known as Long-snouted Spinner Dolphin. Found in tropical waters around the world. Photo taken off Hawaii, Pacific Ocean, USA.